One of my son’s absolute favorite toys is a adorable green alligator pull-toy that ‘clackety-clacks’ when in motion. It was a gift from a dear friend, and when I did some research on Plan Toys, the company that produces this darling toy, I was elated to see that they have an extremely active eco-agenda. If you have been searching for a truly green toy-maker and a fun new friend to tag along behind your little one, Plan Toys is great company to invite into your household. To begin with, Plan Toys are made from all natural rubberwood from rubber trees that no longer produce latex – the first company of its kind to find a resourceful use for this material. Rubberwood is a hardwood tree that can rise to 50 feet or more; the sap is the source of natural rubber. After approximately 25 years, the amount of latex produced declines, and the trees are typically cut down and burned. Plan Toys smartly uses these ‘no-longer-producing-latex’ rubberwood trees that are on the verge of being chopped down (no deforestation is involved). Fallen trees are also replenished with new ones, and no fertilizer is added to the soil for three years prior to the trees being cut. 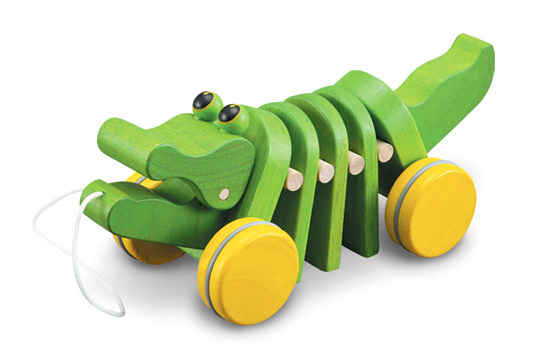 Plan Toys‘ pull-toys are assembled using non-formaldehyde E-zero glue instead of traditional (toxic) wood glue. The dyes used to create the bright, luminous colors are free of lead and other heavy metals and are completely non-toxic and water-based. Printed material contains soy and water-based inks, which are more readily bio-degradable and more efficiently recycled as compared to conventional chemical inks. The kiln which dries the wood of the finished toys uses solar energy and low emission biofuels to power its machinery. Aside from their environmentally rigorous manufacturing processess, Plan Toys is also socially conscientious. Toys are manufactured in Thailand where the company has actively been giving back to the community. They have been involved in erecting a Children’s Toy Museum, which is powered by solar energy. Plan Toys has also taken part in establishing the Sarnsaeng-Arun Foundation and dedicates part of its profits to them. The foundation is a non-profit organization dedicated to fostering the relationship between humans and nature and creating an appreciation for the environment. As if it were not enough, the toys produced are extremely thoughtful and span a wide age-range. There are rattles, dollhouses, puzzles, kitchen-sets, bulding blocks, rocking horses, even pint-sized furniture for children in the form of tables and chairs. The colors are dazzling and engaging, and the prices are very reasonable. I happen to be of the mind-set that a few thoughtful toys and heaps of imagination go a lot further than a ton of plastic, made-in-china junk, and Plan Toys has impressed me with both their design ingenuity, outreach efforts and overall creativity. So great to hear about Plan Toys' eco-agenda since I'd given their pull along snail to a little girl a while back and she loved it! Thanks!